In the Dorito-verse, you have many, many flavor options. For purists, there's the OG Nacho Cheese, while Cool Ranch has grown to be one of the classics in its own right. Hell, if you're jonesing for some Organic Cheddar, they have you covered. But ever wish there was even more options to paralyze your selection process in the chip aisle? No? Well, too bad, because as of Thursday there's a new option on the block and it's primed to delightfully scorch your tastebuds. Say hello to Flamin' Hot Nacho Doritos. Catering to fans of both the original Nacho Cheese Doritos and Flamin' Hot Cheetos, the newest flavor of the iconic tortilla chip brand brings together some cheesy spice, should that be the type of munchies you're craving. The new flavor, which hits store shelves starting January 10, joins the literal hundreds of other flavors the brand has unleashed around the world since it debuted back in 1964. 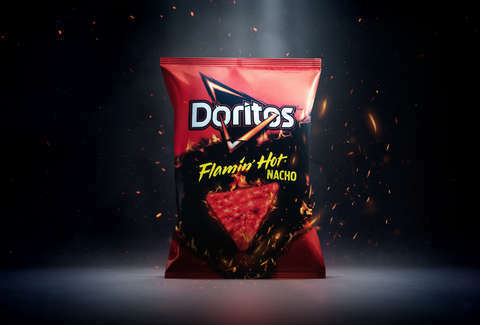 "Doritos Flamin’ Hot Nacho is a new, unique flavor that gives fans the essence of the original Doritos Nacho Cheese with a flamin’ hot kick we know snackers love,” said Leslie Vesper, senior director of marketing for Frito-Lay North America, in a press release. The flavor profile is described as starting with the familiar Nacho Cheese taste followed by a kick of heat that continues to build. Essentially, it sounds like it might be similar to eating a crunchy, cheesy taco doused in hot sauce. Sounds like it might time for another comprehensive flavor ranking.